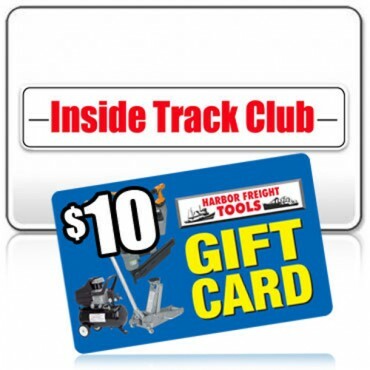 You’ll get at least 150 Inside Track Club coupons in the monthly retail flyer they mail to your house. You can also view and print them from the Harbor Freight web site. More ITC coupons will be emailed to you at least once a week. I think there’s also a daily coupon that you have to get from the Harbor Freight web site. You’ll get access to private member-only sales in the stores that are held every 2 or 3 months. They’re for 2 hours and the ones at my nearby store have been on Sunday nights from 6-8 PM, which is right after it normally closes. Although, the last one was from 4-6 PM. I’ve been to at least 3 of them and I the only customer in the store except for one. And that one only had a couple of other customers. You’ll get additional coupons for the private sales and they even put out free snacks and soft drinks. Sometimes you’ll get an additional 10% off your entire purchase. Normally $170 and on sale for $150. ITC member price is $100. Normally $50 and on sale for $45. ITC member price is $30. I included the last two examples to show that you don’t always save much by being an Inside Track Club member. Anyone could have used one of Harbor’s Freight’s easy-to-find 20%-off almost anything coupons to buy the Cobalt Drill Bit Set for about a dollar less than the ITC price. And they could have used a coupon to buy the drill for only about $4 more. I keep an envelope full of the coupons in my car. I get at least one new one every week from our Sunday newspaper and they’re in all kinds of magazines that I either subscribe to or can get from our library’s free magazine exchange. I’ve seen them in Family Handyman, Field and Stream, Sports Illustrated, Boat US, Flying, Popular Science, Digital Machinist and many more. You can only use one coupon per trip and you can’t use them to buy air compressors, tool chests, welders and one or two other things. They also can‘t be used with other coupons, including the Inside Track Club coupons. By the way, there’s always a coupon for a free item next to the 20%-off coupon. So now I have a large assortment of flashlights, tape measures, screwdriver sets, voltmeters and work gloves. I don’t spend that much at Harbor Freight anymore because I have nearly everything I want and I’m running out of storage room in my workshop. But I get to their store fairly frequently because I’m often very near it. As I said before, I don’t think you have much to lose by joining the club unless you just don’t spend very much money at Harbor Freight, or you buy just some very specific things. I’ve saved quite a bit, although I also probably spent more than I might have by making some impulsive purchases because the savings were too good to pass up. I went with an ITC membership because I saved over $100 on the toolbox that I was buying that night. When they first started ITC, the deals were not very good and I regretted buying into it at first. But they must have received a lot of complaints, because about halfway through my 1st year they started throwing out some really good ITC only deals. But you have to pay attention, because as was mentioned in the post, many of the deals aren’t much better than normal sale prices. But if you make one good size tool purchase, the membership can pay for itself immediately. I also found out that you can’t mix the 20% and ITC coupons in the same transaction at the store, so if you are going to use the 20% on non-ITC items and get some ITC items as well, keep them separated when you go to check out and do it on 2 different receipts. It’s been more than two months since I renewed my membership and wrote about it. My opinion about the Inside Track Club has become less favorable since then because I’ve received two monthly flyers and a bunch of weekly emails and I haven’t seen one darn thing that I’ve been even slightly tempted to buy. Part of it might be me because I already have a lot of tools and I’ve become kind of picky because I don’t have room for many more. But it’s mostly because it seems like the same old stuff is always on sale. New items do go on sale, but it’s not like it was five years or so ago when it seemed you could buy everything in the store on sale if you waited a while. I vaguely recall that there are some truth in advertising laws that say you can’t claim that an item is on sale unless it really is. The proof was that it occasionally sold at its normal selling price for a certain amount of time. I don’t have a collection of monthly flyers I can use to check, but it just seems that many items have been on sale for so long that you could claim that their “sale” price is really their normal selling price. I signed up my hubby for this and they never send a single inside track email. They send the regular emails but nothing about inside track. We tried to get this rectified but we found it impossible. The people on the store give you the run around and tell you to do it online. It is NOT possible to do it online. I tried calling and never got an answer. Well after 12 months the card expired. What a FREAKING waste of money. Most of the deals were just a few dollars cheaper than the regular coupon sale price. Some where EXACTLY the same and actually a few (very few) were higher (but done on another month). All in all this “special” membership was HUGE disappointment and 100% a waste of money. Unless you have NO TOOL or buy a crap load of tools all the time, this is not a good deal. My guess is that only 1 out of 10 get their money worth from the card. That is why they do not show the deals online any more. They want you to gamble and buy the membership and they say you will save money but like any gamble the house always wins. Delia, I agree almost completely with you. They’ve changed since I renewed my membership in February. Since then I have not seen even a single Inside Track Club deal that’s worth making a trip to the store. What I’m seeing now is loads of the same old cheap $5 to $20 crap on sale all the time. You rarely see Inside Track club deals for more substantial and expensive tools. And when you do the savings are not much more than what you could by buying the item with one of Harbor Freight’s easy to find 20% off coupons. And often, you can save MORE by buying the item at its regular price and using a coupon (you can’t use a 20% off coupon with a IT club coupon). They’ve also stopped the special shopping hours when only Inside Track club members were allowed in the store. Now their “special” hours are part of their regular store hours. BFD. And they stopped emailing me the extra weekly Inside Track Club coupons. Which might be good because I’m extremely busy right now and I don’t have time to waste looking at them. You can get the same items for the same price without being inside track. great its in the flyer for $9.99 for anyone. WOW a car jack for $79.99 inside track club price. Its a rip off. I wont be renewing. Inside track a big waste of money! A whole lot of promises no results! I’ve had my eye on their 56″ rolling tool box, (on sale for $799 from $999), since November. Just couldn’t pull the trigger at that price. On December 10 I spotted an inside track coupon on line lowering the price to $699!! I wasn’t an IST member so I decided to join up and take advantage of the coupon deal and save an extra $80 after IST card $30 & $10 gift card, price $720, I’m golden. Guess what, I couldn’t find the coupon on line to save my life. I tried every where on line. Called them up (India), they couldn’t find it either, said it was probably a one day sale. Said they would talk to sales and send a coupon, if they could find it. Haven’t heard from them since. There were other tool boxes on IST also discounted, Gone. I’ll make up my card membership fee during the year, but I’m highly disappointed in there bait & switch tactics. I had the ITC for 2 years (had to sign up under 2 diff emails to get the $10 gift cert) and was fairly happy. I did notice though that alot of times, if I just waited a couple weeks, the everybody coupons were just as good as ITC coupons and sometimes better. I got a coupon for the same tool box but it was a print coupon out of a magazine (not ITC). The bad thing was, I had an SUV and the HF kid 1) would not help me load an unboxed toolbox in my car 2)boxed toolbox would not fit in my car 3) rental trailer was $50. Its a very heavy box and 2 of us probably could not have loaded it in my suv, let alone get it out. Coworkers with snapon boxes are envious (not because of product, but because of price!!). Inside Trac club card is a rip off ! After renewing my card while waiting for a particular item to go on sale I discovered anyone could get the same “sake price” as I did with the insider club card. I was (and still am) pis-Ed. The biggest problem I have is that Harbor Freight does an extremely poor job of keeping their “Deal of the Day” web page and coupons up to date. I have regularly seen the previous weeks web page still posted from 1 to 3 days into the next week. Since you do not know what the “Deal of the Day” is you are basically denied a benefit which you have paid for in purchasing the membership. I have changed computers and logged off and on multiple times to verify that it is their issue and not mine. I have also notified them, they checked the page and found that it was old. It is still occurring. I have found enough specials to validate buying the membership and also getting the $10 gift card at the time of enrollment but I will have to re-consider the next time my card is about to expire. Join a few months ago.. figured why not? Went there today.. filled a shopping cart.. go to check out.. guy says to me, I need to TELL HIM which items are inside track.. Are you kidding me? I just walked around.. noticing the “inside track” price listed.. threw it in my cart. Now I have to keep my stuff separated? Get real.. program is a scam in my opinion. Then you need a coupon for this.. coupon for that.. what a cluster. Northern tools will get my business from now on. I spent like 3k there this year alone. No more.. I have a gift card from Harbor Freight. Tried to use it in their store. I was told that I would have to go on line to activate it. Guess what there is no place on line to activate it. I called customer service they told me my card was no good. I don’t recommend purchasing any gift card from this company. What I always do with regards to buying stuff from Harbor Freight on discount I have to stand on the corner and punch myself in the [email protected]#&* face a 10 or 20 times…… I get a better value that way. Folks, buy a two year, it averages to $22.50….I’m certain I can save $22.50 this year, and next year. I only have an inseder membership because one day we got a few things, and the cashier said if I buy an inseder club membership, with what I spent I would save xyz amount, and the insider club membership would after the days discouns cost me exactly $5. so I took the membership ! Do you like the it? I’ve been debating it. I went in to buy the Predator 4000 watt generator, $339 regular price. 20% coupon does not work on Predator products. Then a floor manager comes over with an ITC membership catalog showing the gen for $284, but I have to buy a 2 year membership, $45. So I end up spending $329, saving $10. Better than nothing. They give me the ITC catalog and the next parking lot sale flyer which is a week away, but I don’t look at it till next day. The parking lot sale has the gen for $279, no ITC needed. Excellent way to PISS ME OFF!